If you are separating from your spouse and you are grieving, you are not alone. In the video below, Canadian divorce lawyer Brian Galbraith discusses the pain he went through during his own divorce. If you are going through divorce in Tampa Bay, you should choose a lawyer who will help you resolve your disputes as quickly, cost-effectively, and painlessly as possible. Further, you should choose a divorce process that will help you heal and not tear your family apart. We at Family Diplomacy, like Brian Galbraith, practice exclusively in out-of-court dispute resolution, and we are strong promoters of collaborative divorce. Collaborative divorce is a process where each spouse can rely on his or her own attorney for advice, and the attorneys concentrate solely on helping the spouse reach an agreement peacefully, quickly, and outside of court. This means that no billable hours are spent on opposition research or engaging in dirty trial tactics. This also means that collaborative lawyers are focused on the future and not on laying blame for the failure of the marriage or on criticizing either spouses’ parenting skills. The end result is a divorce process where the soon-to-be former spouses have the chance to move forward with their lives as healthy, independent individuals or even as effective co-parents. If you have questions about how the collaborative process can help your family through the pain of divorce, schedule a consultation with Family Diplomacy: A Collaborative Law Firm at (813) 443-0615 or CLICK HERE to schedule a meeting with Adam B. Cordover. Adam B. Cordover trains attorneys, mental health professionals, and financial professionals how to engage in collaborative family law, and he has lead workshops on collaborative practice throughout the United States and in Canada. 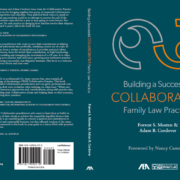 Adam is the co-author of an upcoming American Bar Association book on collaborative law.